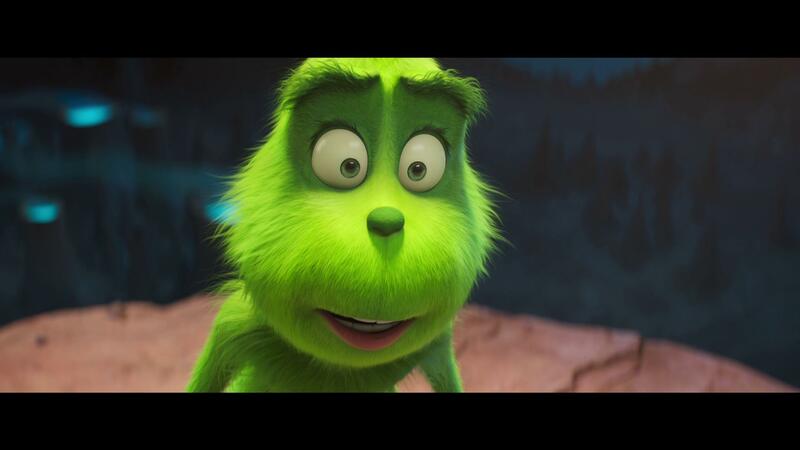 The Grinch (2018) - 4K UHD Review - ReDVDit! 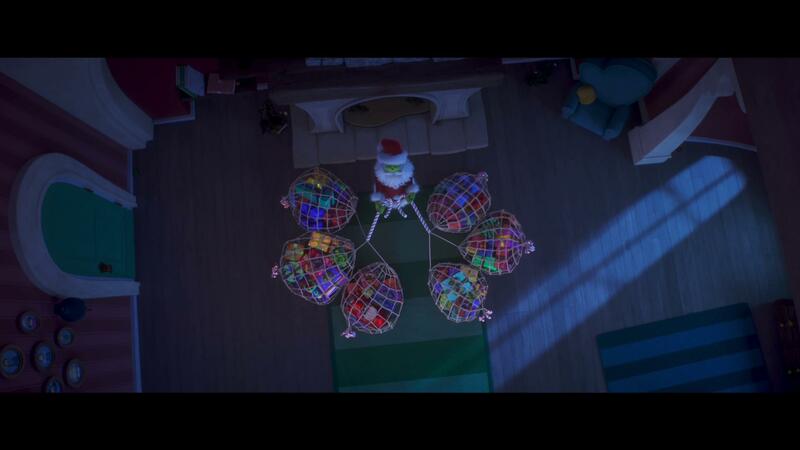 The Grinch (also known as Dr. Seuss’ The Grinch) is a 2018 American 3D computer-animated Christmas comedy film that was produced by Illumination. Based on the 1957 Dr. Seuss Book titled How the Grinch Stole Christmas!, it is the third adaptation of the story following the television special from 1966 and the live-action feature-length film from 2000. It marks Illumation’s second Dr. Seuss film adaptation, following The Lorax in 2012. The film was directed by Yarrow Cheney and Scott Mosier, and written by Michael LeSieur and Tommy Swerdlow. 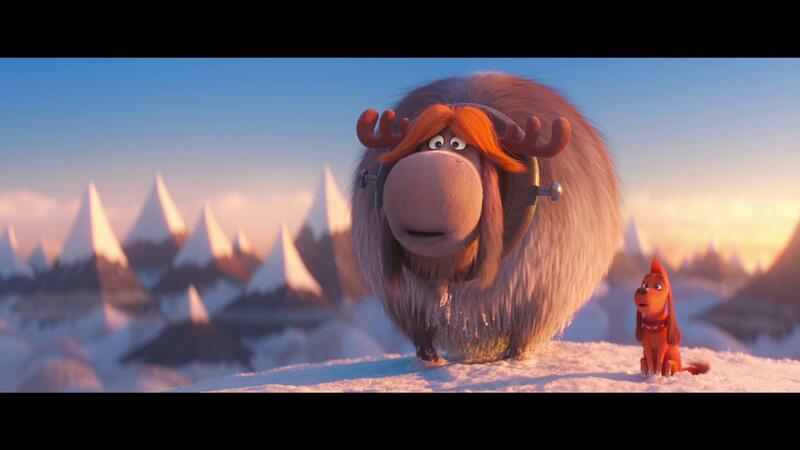 It also stars the voices of Benedict Cumberbatch, Rashida Jones, Kenan Thompson, Cameron Seely, and Angela Lansbury, and is narrated by Pharrell Williams. 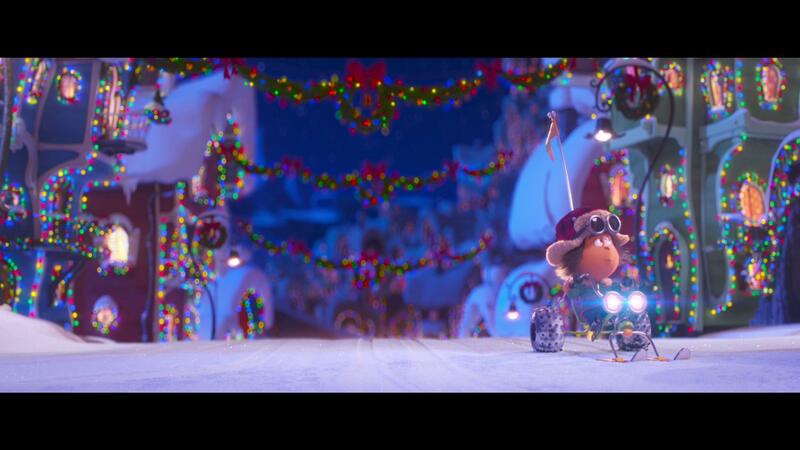 The plot follows the Grinch as he plans to ruin Whoville’s Christmas celebration by stealing all of the town’s decorations and gifts. The Grinch was released by Universal Pictures in the United States on November 9, 2018, in RealD 3D and select IMAX theaters. 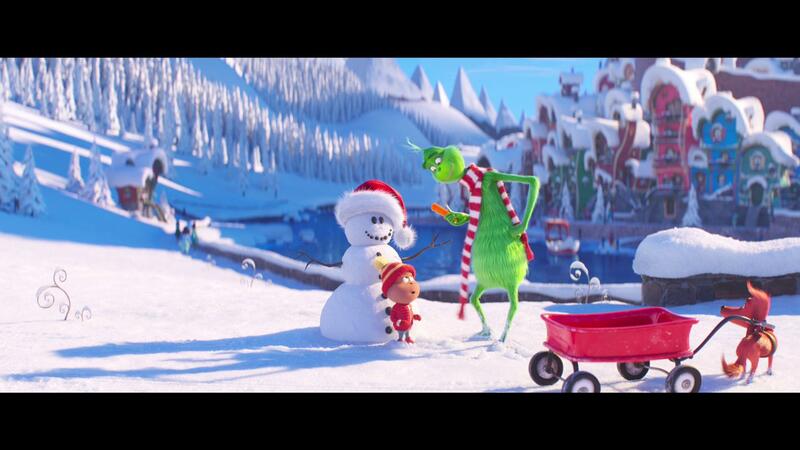 It has grossed over $508 million worldwide, becoming the highest-grossing holiday film of all-time, as well as the highest grossing Dr. Seuss film adaptation. It received mixed reviews from critics, who praised the animation but the film added little to nothing new to the source material. It is also the final adaptation released during the life of Seuss’s widow, Audrey Geisel, who served as executive producer of the film and unfortunately passed away on December 19, 2018. 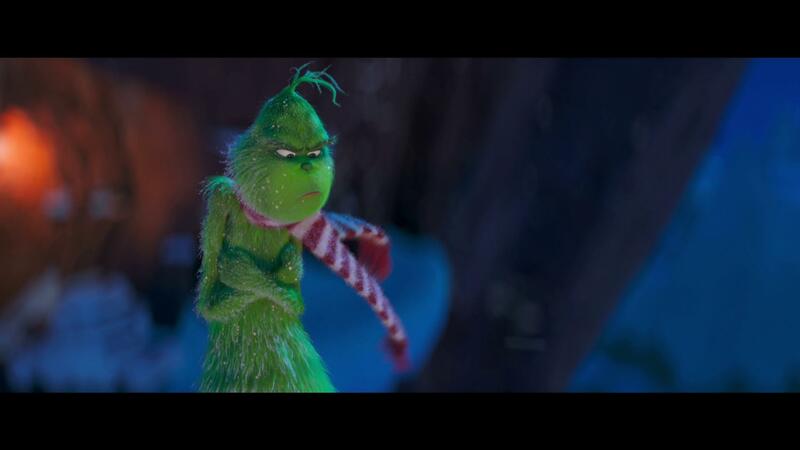 This new remake of The Grinch is a movie, that while it really didn’t need to be made, it recognized that fact as it poked fun at that status during the various promotional items that aired on television. A charming attempt to break itself free from that criticism that accompanies the thought of a remake, this new film adds a small bit of plot line that had originally made itself present during the live-action version, but presents itself in a manner that makes it much more appealing to the younger audiences. Overall, it’s a pretty decent retelling of the Christmastime classic that has a few touches of modern variety, and overall it managed to remain true to the story details that Seuss had originally put out during the 1950s. 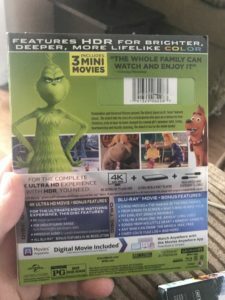 Overall, the 4K UHD release of The Grinch is what is considered to be a “fake” 4K release as it’s upscaled, but it is also being presented with Dolby Vision color enhancement, which significantly add to the visual qualities that come with the animation. Overall, the textures that are presented within this movie are much more distinct than the included Blu-ray counter part, and the sharpness to the animation are much more distinct, allowing those who have a television that’s capable of processing Dolby Vision to be able to truly appreciate the work that the animators put into making this movie. Overall, my wife and I were genuinely pleased with the presentation of this release and the utilization of Dolby Vision throughout, allowing for this to be one to certainly be sure to revisit as our son becomes more of age for the movie. Packaged with an English Dolby Atmos audio track, the 4K UHD release of The Grinch provides its viewers an absolutely impressive audio experience that’s accompanied with an absolutely firm and beautiful musical score composed by Danny Elfman. There’s an obvious sense of layering in the audio track, allowing for an added sense of immersion that’s not immediately noticed with Atmos, and the transitionary effects in between channel to channel were effortless, and really making sure that it feels as if you’re right there in the middle of everything. Dialogue is spoken cleanly, allowing for the characters to be heard and understood without any need to adjust the volume levels at all throughout. 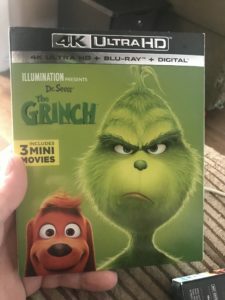 The 4K UHD release of The Grinch comes packaged in your standard two-disc 4K UHD amaray case. Within the case, the standard 4K copy and the standard Blu-ray copy of the movie. The UHD includes the same artwork that’s been included on the case while the Blu-ray has the standard release text and solid green background. There is also a digital copy redemption pamphlet as well as a slipcover that’s been made available in the original pressing of the release that features the same artwork as the case. From Green to Screen – A variety of interviews with the voice actors and production crew as they discuss the backstory of the Grinch, the casting and the qualities that the actors brought to the characters and story. Illuminating the Grinch – Explore the challenges of maintaining the original look from Seuss’ stories, and the visual stylings used to bring them into a digitally animated feature. My Earliest Grinch Memories – The cast and crew share how the character and the story had impacted their lives. 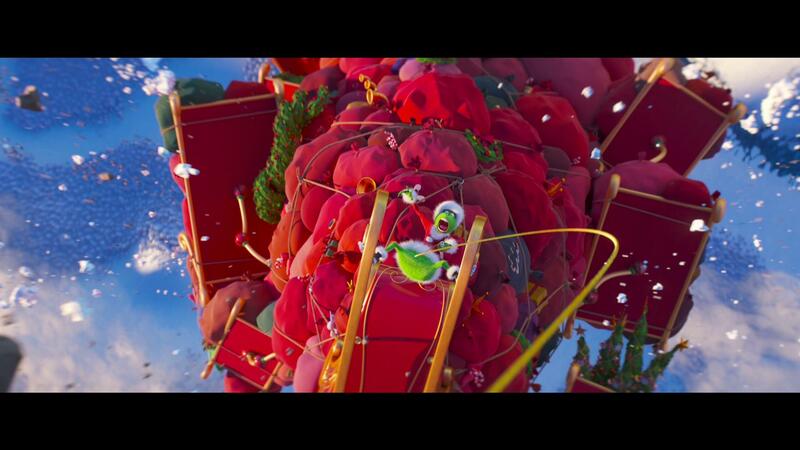 Grinchy Gadgets – A look at the Grinch’s tools. Songs from His Little Heart – A discussion of the immersive musical landscape and how singing and vocals define the movie. It also looks at the various qualities that Composer Danny Elfman brought to the movie. Any Who Can Draw – Instructional videos allowing for the chance to learn how to draw The Grinch, Max, and Fred with the Head of Story Mark O’Hare. Christmastime Around the World – A quick look at some of the more unusual Christmas traditions around the globe. Cindy-Lou’s Yule Log – A small fireplace scene that’s inspired from the movie, set to music and dialogue while the Grinch systematically removes the Christmas decorations from the fireplace area. Production Babies – A first-name list of the babies that were born to the crew during the production stages. Overall, I found that this remake of The Grinch to be a pretty solid remake, in terms of children’s movies. There really aren’t any parts that include the typical “adult” oriented jokes that we’ve seen from features, like this; but overall, it wasn’t that bad. The video and audio presentation of the 4K UHD release were top notch, and did a surprisingly great job at offering a different experience than the Blu-ray counterpart. There’s a ton of special features included in this release, that are also available on the UHD but at the 4K resolution. If you’re considering this release for your collection, I’d definitely recommend picking it up if you’re either a fan of the Grinch storyline or have children too. The Grinch will be available on 4K UHD, 3D Blu-ray, Blu-ray and DVD beginning on February 5.